Tim Cook recently boasted that Apple TV has been selling like hot potatoes. His company has sold around 13 million of them, with half of those flying off the shelves in the last year. The WD TV Play is Western Digital's boldest attempt to grab itself a Luis Suarez-sized bite of that particular Apple. Like Apple TV, WD TV Play is principally a media-streaming box with a limited selection of smart TV apps. While Apple TV sells for £99 / US$99 / AU$109, however, WD TV Play is cheaper, with a price tag of £69 / US$69.99 (around AU$72.50). And the DLNA-compliant WD TV Play isn't constrained by iTunes, plus it boasts the BBC iPlayer in the UK, which is a significant benefit for British viewers. But while the WD TV Play welcomes 1920 x 1080p 24fps video and Dolby TrueHD audio, DTS and MPEG2 are barred from the playground. Western Digital has a couple of other units in its media streaming portfolio, including the WD TV Live, which is bigger, more expensive and can handle a wider range of file formats. Top dog in the Western Digital lineup is the WD TV Live Hub, which has a built-in network drive and can stream to other DLNA units in the home. Somewhat surprisingly, the WD TV Play box features an analogue AV output, and is bundled with an AV lead that features composite video and RCA stereo phono plugs. You'll need to buy your own HDMI cable and digital optical audio lead (not that Apple supplies any digital cables). An Ethernet socket enables you to get a wired network connection, but the WD TV Play is of course designed for wireless use. The only other connection is a USB socket on the side, which is handy for accessing local storage or running a wired keyboard. Measuring 106 x 105 x 27mm (4.2 x 4.1 x 1.1 inches), WD TV Play is plasticky, but seems durable and looks smart enough with a blue LED that glows faintly from within the fascia when the box is in use. The remote control is less impressive, being cheap and light with spongy buttons. The best thing about it is that there is a dedicated Netflix button and four other buttons that can be assigned as shortcuts to other apps or tools. Setting up and operating the box is nowhere near as effortless or enjoyable as using the Apple TV, partly thanks to the use of numerous icons without labels. Some are easier to guess than others, but who wants to spend time clicking on symbols just to see what lies within? The GUI is at least more customisable than Apple's, and you can select the splash screen image from a handful of pre-installed photos or your own networked JPEG files. You can set preferences for slideshows, music and video playback including subtitle font size, up to an unambiguous 68pt size. Entering text is tedious using the alphabetically sequenced on-screen keyboard. An iOS and Android app is a better choice for operating the box in many ways, especially with the provision of a QWERTY keyboard that shortens text inputting times dramatically. Switch WD TV Play on and you are greeted with a grid of favourite apps and widgets, laid out attractively as a series of panes of various sizes. It's easy to move icons around, remove them or introduce others by trawling through the box's collection of apps. These are divided into six genres, comprising Movies & TV, Web Videos, Music, Photos, Sport & Games and Social & News. The Movies & TV category contains Flixster, Viewster, Netflix, Yupp TV, Sling Player, Snag Films and BBC iPlayer, while the Web Videos lineup includes Comedy Time, Launchpad, Watch Mojo, Vimeo, AOL HD, YouTube and Daily Motion. Music apps include Spotify, Deezer, Shoutcast, Live 365 and TuneIn, while under Photos there's Picasa and Flickr. In the Sport & Games group you get Funspot, Red Bull, College and Digital Network, and finally in Social & News you'll find Facebook, Accuweather, RSS Newsfeed and Twitter. Sadly, there's no internet browser, and there are some killer apps missing that would make the WD TV Play a more compelling proposition, such as Lovefilm, 4OD, Blinkbox and ITV Player in the UK. Even if you add the apps to the home screen they also appear grouped in separate pages that are simple enough to access. We didn't have a Slingbox to hand but the SlingPlayer app is an interesting addition, enabling you to watch TV or PVR recordings when using the WD TV Play say in a bedroom, or even on holiday or work trips, since it's certainly easy enough to transport. Some apps seemed less stable than the southern European economies of the Eurozone, though. Fast forwarding was rather vague when watching Arrested Development on Netflix, which also quitted unexpectedly a couple of times. This was more successful than iPlayer, where after we pressed pause we were left listening to the commentary in The Time Traveller's Guide to Elizabethan England but couldn't see the picture and couldn't exit the application without rebooting. Snag Films is a dusty archive of low bit-rate bizarre independent and otherwise long forgotten movies such as The American West of John Ford, a weird 1971 documentary set in Monument Valley, and The Black Book, a 1949 wartime spy story by Anthony Mann. The picture quality was frustratingly dire. Flickr's implementation lacks polish, you can only see photo streams and not collections or sets, plus photos often have the wrong aspect ratio. The Twitter and Facebook apps also lack refinement, requiring additional zooming to read complete messages and postings. We also found that the WD TV Play box sometimes took an age to start up, and couldn't be guaranteed to work at all if the USB had a flash drive in it at boot up. Media streamed from a home network or from local storage is presented in an inefficient and rather dull fashion, with folder structures often not recognised. File compatibility supposedly extends to most common containers and files, including AVI, MKV, TS/TP/M2T/M2TS, MP4/MOV, WMV9, FLV, JPEG, GIF, TIFF, BMP, PNG, MP3, WAV, WMA, AAC, FLAC, MKA, AIF/AIFF, OGG and Dolby TrueHD. Rather than decode DTS, the box offers passthrough over optical or HDMI, but a compatible AV receiver is needed. One of the arguments in favour of Apple's ecosystem is that compatibility is determined by the client - in other words, if it plays in iTunes, it plays on Apple TV. With WD TV Play there are no guarantees, and although USB-connected storage maximises your chances of success, some MP4 and WMA files wouldn't load, and an M4V file actually crashed it. We were able to play a wide selection of other files reliably and stably from a flash drive, though, including MKVs with embedded subtitles. But FLAC, WMA, DivX and MKV all disappeared from the lineup of a DLNA-connected Toshiba Windows 7 netbook. The WD TV Play has a broad selection of approximately 30 video on-demand and other apps including iPlayer, Spotify and Netflix. It can also stream a diverse selection of media from a DLNA home network (including 1080p movies) or from locally mounted USB storage. The remote control and user interface offer a fair degree of customisation, and the smartphone app is a highly rewarding way of operating the box. File playback excludes DTS audio and MPEG1 and MPEG2 video by design, while you can't rely on the box to play many of its supposedly compatible files. Eventually you could learn which files the box prefers, so of more concern is the instability when using video on-demand apps, especially BBC iPlayer. Other apps also lack polish. 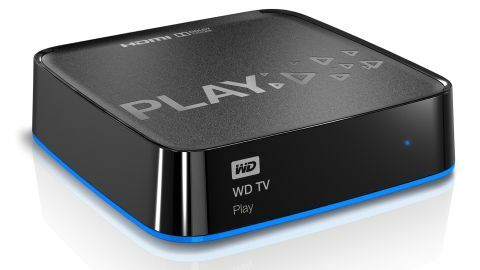 The WD TV Play has a low price for a DLNA-compatible wireless box with access to a range of video on-demand and other streaming services. Although its interface is attractive and versatile, its flakiness when streaming online services and limited codec support render the WD TV Play less of a bargain than its price otherwise seems. Apple TV can be equally frustrating in terms of its file handling, although third-party apps exist to convert most movies and audio files into iTunes-friendly forms. Nor does Apple TV have iPlayer or Spotify, but it does have a good range of movies and TV shows to rent or buy thanks to the iTunes store. It also has a much slicker user interface. For DTS, MPEG1 and MPEG2 compatibility it would be worth spending another £20 on the WD TV Live unit. And although limited to 720p resolution, the Roku LT has access to more online streaming services, but is not worth buying if streaming home networked multimedia is a priority.